Magnetic island geometry showing the asymmetry effect that is crucial in determining the mechanism for the density limit. Reprinted with permission from Phys. Plasmas 22, 022514 (2015). Credit: Copyright 2015 AIP Publishing LLC. Researchers at the U.S. Department of Energy's (DOE) Princeton Plasma Physics Laboratory (PPPL) have developed a detailed model of the source of a puzzling limitation on fusion reactions. The findings, published this month in Physics of Plasmas, complete and confirm previous PPPL research and could lead to steps to overcome the barrier if the model proves consistent with experimental data. "We used to have correlation," said physicist David Gates, first author of the paper. "Now we believe we have causation." At issue is a problem known as the "density limit" that keeps donut-shaped fusion facilities called tokamaks from operating at peak efficiency. This limit occurs when the superhot, charged plasma gas that fuels fusion reactions reaches a certain density and spirals apart in a flash of light, shutting down the reaction. Overcoming the limit could facilitate the development of fusion as a safe, clean and abundant source of energy for generating electricity. The key to this barrier lies in the runaway growth of bubble-like islands that form within the magnetically confined plasma and cool it, according to the paper. While physicists had long suspected that this cooling effect was linked to the density limit—also known as the "Greenwald limit" after MIT physicist Martin Greenwald, who derived an empirical rule for it—they lacked insight into the mechanics. Ironically, it was White himself who showed that his 1977 paper was not really the last word on the subject. In a new paper published in Physics of Plasmas last February, White demonstrated that when the thermal balance in an island tips from heating to cooling, the island also becomes asymmetric. The asymmetry cancelled the effect of the 1977 equation that indicated island stability and caused the Rebut model of island growth to be dominant. "I don't know why we didn't think of the thermal balance in the island before," White said. His discovery grew out of conversations with Gates, a coauthor with PPPL physicist Dylan Brennan of White's February paper. Gates had reviewed data on the evolution of islands in fusion experiments and noticed that they became asymmetric at the density limit. After consulting with White, Gates hypothesized that the development might be important. 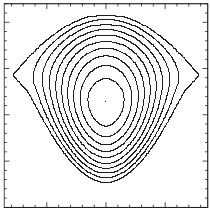 He and White then added the effect of this asymmetry to the Rutherford/White and Rebut equations to complete a revised model of the source of the density limit. Still to come are papers on a numerical simulation of the model by Brennan and the impact of different mixtures of impurities on the density limit by physicist Luis Delgado-Aparicio of PPPL. Both had joined White in coauthoring the Gates paper. Also ahead are comparisons of the new model with past experiments that disrupted at the density limit. Graduate student Qian Teng is to make these comparisons. "So far we've shown that in principle the full equation works," said White. "Now we must check it against detailed disruption cases."